Lehigh Valley Hospital (LVH)–Hazleton is getting ready to meet the future of health care this spring. That’s when the first phase of a three-prong renovation, expansion and construction project is set to begin in the greater Hazleton area. Over the past months leaders throughout Lehigh Valley Health Network (LVHN) have been working with developers, architects and facility planners to put the best design minds to work to modernize its hospital campus in Hazleton and create a new “health care campus of the future” in Hazle Township. When the project is completed in 2019, it will include a new hub for outpatient services in a walkable “medical mall” concept that resembles an upscale lifestyle center. This spring, construction will begin on an LVH–Hazleton renovation project that includes an expanded lobby, room upgrades that will transform the hospital’s double rooms into private rooms, modern flooring, lighting and other features. Wiring for a future electronic medical record (EMR) system will also be installed. Additional upgrades are planned throughout the hospital. This summer, the hospital will embark on an expansion project that will result in an expanded ER and check-in area, large treatment rooms with increased privacy, a secure behavioral health zone, double trauma bay, additional ambulance bays (3) and other features. The expansion will improve patient comfort and access, as well as the care experience for patients and their families. Lehigh Valley Physician Group (LVPG) services in center city Hazleton will also be expanded through an increase in physical space and the addition of primary care and OB-GYN services to our existing ExpressCARE and pediatric services. 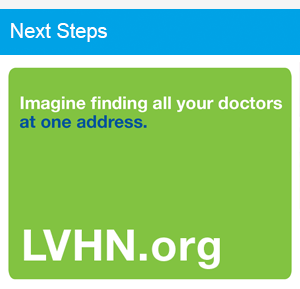 Also this summer, LVHN will begin construction on its “campus of the future.” The strategy is a direct response to health care trends that show decreasing rates of inpatient care and an increased need for outpatient services. Plans include expansion and renovation of the current Health & Wellness Center and the LVPG–Alliance Drive location (formerly known as the Dessen Center), as well as new construction. When complete, the campus will provide comprehensive services from primary to specialty care, wellness facilities, a pharmacy and other features.